*whips off food cover*, oohs and ahhs commence. With this in mind, we’re stoked to be part of a new trend in making Thai food even more interesting and delicious than ever, which also includes a unique twist that makes each meal a truly personal experience. Once you’re done, you’ll understand the food of northern Thailand better than almost anyone. Over the past two decades, we’ve been fortunate to make friends with many of the hilltribes of northern Thailand, including the Lahu people, who live in the area around Chiang Mai. We’re really happy to be able to say that our Lahu friends play an important role in this new culinary endeavor. 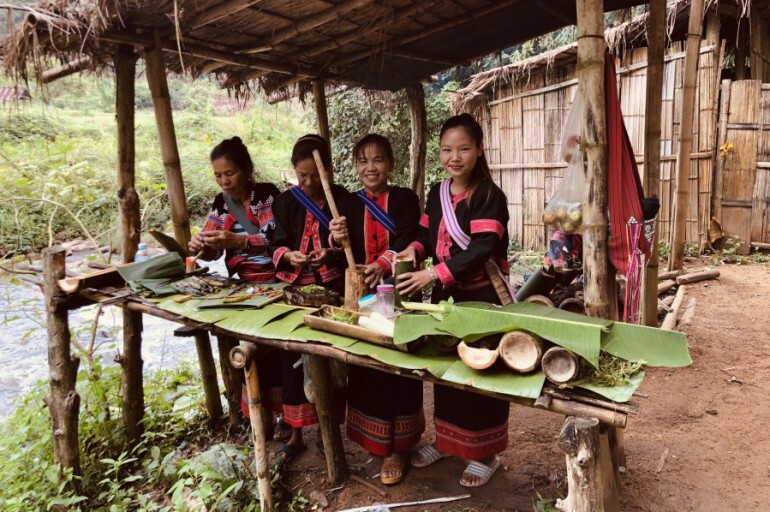 As part of our northern adventure, we are able to join the Lahu tribe in the gorgeous, rugged area near Mae Ai, Chiang Mai – a stone’s throw away from the border with Myanmar – as they get ready to whip up lunch for the gang. But it’s not just any lunch; indeed, the way they prepare it is what gives the outing such a cool twist. Over the course of the morning, we join them as they head out into the lush and remote hillside to forage for the ingredients that will be used in our lunch. No supermarket delivery or raiding the crisper in your fridge here! During the outing, our hilltribe friends will explain how their culture has influenced some of the region’s most well-known dishes (and vice versa), as well as how their diets and farming techniques change from season to season in line with sustainable crop management. (This will also affect the meal you eat – no two meals are exactly the same). When the foraging is done, you’ll be carrying wild mushrooms, galangal, lemongrass, and various other herbs and edibles that will play a part in your lunch. As the food is prepared, you’ll get a fireside lesson in just what goes into making hilltribe food which, while still Thai, is different from standard Thai food in a number of ways. The best part – no dishes to do! All the cooking and eating is done using tools and utensils made from bamboo and other locally-sourced material. Sustainability at its best! It’s a fantastic day out, and when you’re done you’ll have seen Thai hilltribe food from a whole new perspective. But the experience doesn’t end there – that evening, we’ll dine at Locus Native Food Lab in Chiang Rai town, a groundbreaking new joint that’s bringing hilltribe food to the masses. Run by celebrity chef Kong, Locus takes the same local, sustainable approach to food, but sprinkles some glitz into the proceedings in a unique melange of down-home cooking and five star hospitality. This Northern adventure is a unique and rewarding experience, and when it’s topped off by a great meal with friends new and old (and perhaps a glass of wine or three)… well, you simply can’t do much better than that.